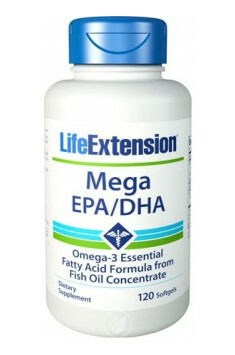 Life Extension Mega EPA/DHA is a dietary supplement in the composition of which there is an ideally balanced, appropriately high dose of omega-3 fatty acids: EPA (720 mg) and DHA (480 mg). They have been isolated from the highest-quality fish oil subjected to molecular distillation. It is the only technological process, which guarantees 100% effectiveness in removing metals, PCB and other toxic substances. Thanks to this, the final product is characterized by the highest purity, is non-toxic and is safe for the organism. The preparation is recommended as general health prophylaxis. EPA and DHA play a range of important functions in the organism: they are precursors of vital bioactive mediators, are responsible for the proper functioning of the nervous system, influence the work of heart and protect against circulatory diseases. They are essential to maintain optimal body condition and mental efficiency. EPA and DHA, i.e. eicosapentaenoic and docosahexaenoic acids are organic compounds from the group of unsaturated essential fatty acids (EFAs). Specific chemical structure gave it the name of long chain fatty acids of omega-3 type. EPA plays in the organism the role of DHA precursor, however, the synthesized amounts are too small in order to fully satisfy the needs of the organism. EPA and DHA have an important influence on health and proper functions of the organism. DHA mainly fulfills building functions – it is in the composition of phospholipids, cell membranes and conducts intercellular metabolic processes. It constitutes a considerable part of acids present in the brain and eye retina and its high amounts are stored in the heart. EPA is primarily responsible for the production of eicosanoids – tissue hormones, which regulate the growth of cells, muscle activity, coagulation processes and synthesis of various hormones and neurotransmitters. In numerous scientific studies it has been proven that there is a strict correlation between the intake of omega-3 acids and the risk of developing heart and circulatory diseases. It is assumed that omega-3 acids may decrease mortality in patients after myocardial infarction and lower the risk of sudden cardiac death. Enriching a diet with omega-3 acids positively influences lipid profile. It lowers the concentration of triglycerides and unbeneficial cholesterol fraction LDL and simultaneously it leads to the increase of “good” HDL cholesterol level. By the same token, the risk of developing atherosclerosis becomes minimized. EPA and DHA acids have anticoagulant properties. They inhibit the aggregation (agglutination) of platelets, accelerate fibrin breakdown and consequently prevent the creation of dangerous clots and embolisms. Omega-3 fatty acids protect against heart rhythm disturbances. They affect subentities creating sodium and calcium ion channels, leading to the decreased activity of cells building heart muscle (cardiomyocytes). Thanks to this, the amount of abnormal and irregular heart contractions is limited. Omega-3 acids positively modulate blood pressure. They change the composition of fatty acids in cell membranes and the amount of ATP resealed from the cells of vessel endothelium and also they lower the concentration of noradrenaline in the plasma. All these factors prevent the excessive increase of pressure. It has been proven in numerous experimental and clinical studies that omega-3 acids are essential for neurological health and mental well-being. While DHA is responsible mainly for maintaining proper brain structure, EPA primarily influences mood. DHA stimulates growth and development of neurons. It makes nerve cells more branched and elastic, thanks to which they may better fulfill the assigned functions. As a building block and cell membrane modulator, DHA is responsible for proper cell signaling. Such activity is reflected in mental ability – good memory, logical thinking, pace of processing information and the ability to associate facts. Researchers claim that there is a strict relationship between depression and insufficient amount of EPA in a diet. It has been proven in many randomized, placebo-controlled studies that supplementing a diet of patients suffering from depression with omega-3 fatty acids and especially EPA, contributed to alleviating the symptoms of the disease and limited the frequency of depression episodes. Both DHA and EPA protect against the drop in cognitive functions and lower the risk of the development of neurodegenerative diseases. People with low level of DHA and EPA in hippocampus neurons performed much worse in cognitive tests and were more often diagnosed with Alzheimer’s disease. Supplementing the diet with omega-3 acids, on the other hand, was reflected in the improvement of memory and better cognitive functions in all subjects. Omega 3 fatty acids may prevent various civilization diseases, especially induced by the harmful influence of free radicals and chronic inflammations. They reduce oxidative stress and protect cells against damages caused by the activity of reactive oxygen forms. Eicosanoids from EPA (prostaglandins, thromboxane and leukotrienes) regulate the course and intensity of inflammatory reactions in the organism. Summing up, Mega EPA/DHA is the best way to supplement diet with unsaturated essential fatty acids. It allows to maintain health and mental efficiency at all ages and protects against the risk of atherosclerosis and cardiovascular diseases. It is especially recommended to pregnant women, seniors and sportsmen who expose their organisms to excessive physical effort. 1 capsule, 1 to 3 times a day, during a meal. International health organizations recommend prophylactic intake of EPA and DHA at the level of min. 500 mg a day. Because of the high content of omega-3 in the supplement, 1 to 3 capsules a day suffice in order to achieve the desired effect. For maximal absorption of active substances in the supplement, it is worth taking the preparation with a meal containing a source of fat. It should be borne in mind that omega-6 fatty acids are a kind of competition for omega-3 acids. Because of this, the supplementation should not be combined with a meal providing large amounts of omega-6 fatty acids (e.g. from vegetable oils). Vitamin D3 in a dose of 5,000 IU in soft capsules. Effectively complements vitamin D3 deficiency. Vitamin B12 in liquid, in the biologically active form of methyl cobalamin.